Since inauguration day, thousands of people have been finding their own ways to resist the changes that endanger themselves and the people they care about. Some people are newly politically activated and lots of people have already been fighting for their lives long before the Trump administration came to power. As a White person, I believe I have a responsibility to keep my hope for solidarity and fire for resistance alive. Recently, I had a healing experience that supported me in this goal. My mother is one of the women who marched on January 20th. Like so many who showed up that day, she is scared for the first time in a long time. I felt alienated from her as this revealed how much she had not been taking my concerns seriously about problems before Trump. On the day before the march, she sent me a picture of the sign she had made with the caption, “I couldn’t fit everything on it.” I cried when I saw that she had included the slogans “Immigrants make America great” and “Love is love” in addition to “Women’s rights are human rights” and “Climate change is real.” To me, these simple statements showed that she values an inclusive resistance, that she values my loved ones, that she values me. Until she stood up for me as a queer person, and my friends who are immigrants, my mother’s passive acceptance hadn’t done anything to keep me or my loved ones safe. After that, each sign I saw with an inclusive or intersectional message helped me feel less alone. Reaches for dialogue across this division can be painful and frustrating. The lack of current and historical solidarity between marginalized groups is palpable. In particular, I’m thinking about the ways in which White women in the feminist movement have silenced and dismissed women of Color. 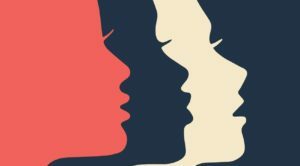 I’ve been struggling to hold my multiple perspectives that acknowledge the power and potential of more people hitting the streets alongside my fears that White feminism’s history will repeat itself and that what arises from the women’s march will only benefit White, cisgender, heterosexual, abled, middle-class-or-above women. There are still many more difficult conversations to be had within the resistance, and I will be holding on to this reminder that they can be worth having. I hope that you will see this story as an invitation to dialogue with those who share your privileges, and an invitation to show your solidarity with those who are marginalized in ways that you aren’t. These small (or big!) acts could chip away at the isolation so many people are feeling in the face of political oppression. This post was written by a member of the The Relational Center Community who has asked to remain anonymous.